It has now been for a year that Govt. 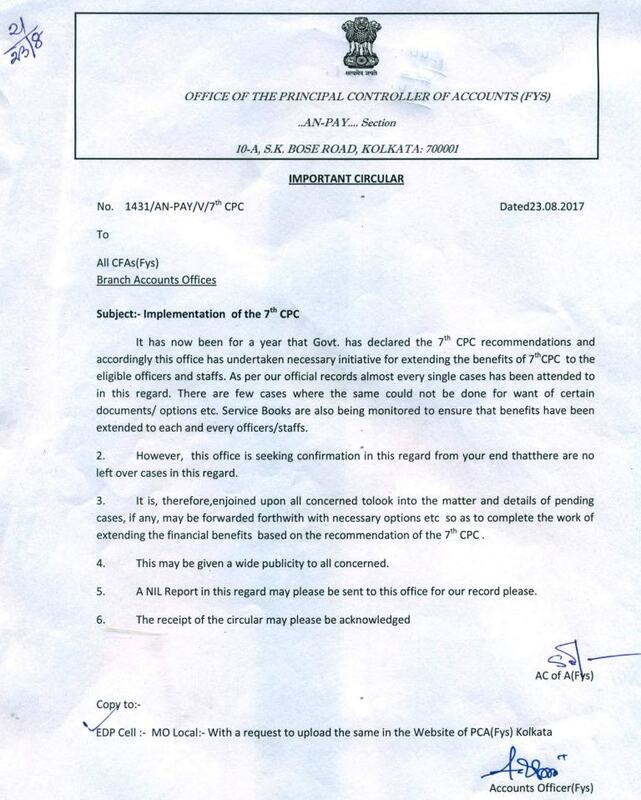 has declared the 7th CPC recommendations and accordingly this office has undertaken necessary initiative for extending the benefits of 7th CPC to the eligible officers and staffs. As per our official records almost every single cases has been attended to in this regard. There are few cases where the same could not be done for want of certain documents/ options etc. Service Books are also being monitored to ensure that benefits have been extended to each and every officers/staffs. 2. However, this office is seeking confirmation in this regard from your end that there are no left over cases in this regard. 3. 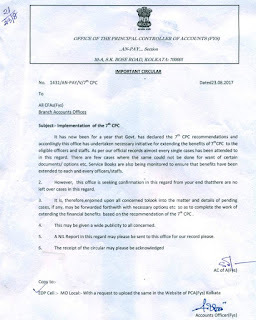 It is, therefore, enjoined upon all concerned to look into the matter and details of pending cases, if any, may be forwarded forthwith with necessary options- etc so as to complete the work of extending the financial benefits based on the recommendation of the 7th CPC . 4. This may be given a wide publicity to all concerned. 5. A NIL Report in this regard may please be sent to this office for our record please.